People are living on the continent Ogrij. Its capital is O’Delvais in the valley of Sarat. They are distinguished by their intelligence and strength of will. If you decide on this breed, so you will be welcomed to kick their head umpire Kort. However, you choose the race of Magmar, a well-known for its strength the people who live on the continent of Khair and legend from the monster itself emerged volcanic blood should be, you have a capital Dartrong and your head of the leader Torgor. The head of your area sent up immediately on your first quest, the fight against monsters that beset him. The battle system is turn-based war in dragons. In all your trains, you can choose to attack like that part of the body of your opponent’s you, the head, the middle or the legs. However, not only against monsters, you can compete in the browser game, but also against other players who play together with you online. they belong to the same faction as you yourself so you can choose between a duel in which one competes against one, a group fight in which you connect yourself to a team, and the chaotic struggle in which the teams will be chosen at random. Do you want to measure you prefer the opposing faction, so you have the safe walls of your city to leave. Skirmishes between the two races may soon end up in adult mass slaughter. 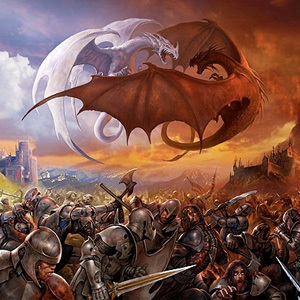 Depending on the number of players involved between large battles, epic battles and bloody battles. The bigger the battle, the higher the reputation gained the winner. With increasing reputation You step in the war on rank. From simple recruits you can get it that way until the master. Also a good community is of course required for the acting. Therefore, the Game, like other online games, including the ability to ally with other players. Did you find like-minded people, so you can create a clan and invite you to join, or even join an existing clan. And have you ever not feel like you are fighting through hordes of enemies and also want to take things a little more peaceful life, you may from time to time, maybe even once a „normal“ job. There are three different gathering skills, three production occupations and three liberal professions, of which you can learn each one. Your products, you can either sell to the NPC merchants or directly to other players. Like other online games are also funded this role-play browser game including the sale of special in-game items. These you can buy diamonds for a currency that is paid for with real money. Examples of such premium content is customized avatars and clan crest, but also wedding rings for you and your significant other.